Call centre operations are rapidly returning to the UK. After a short period of high volumes of work being outsourced to India and the Far East, the need for call centre furniture in the UK is on the rise once again. 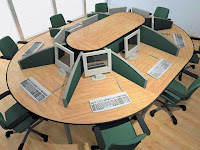 Call centre furniture differs from more conventional office setups because they have to accommodate different needs - they generally need less space per user, but more sound insulation than traditional office environments. Slightly contradictory needs when you consider that the employer will want to fit in as many workers as possible! 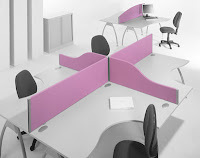 The issue of sound insulation has led to a general shift away from the more traditional cluster designs of call centre furniture in favour of linear bench desks. This has the big advantage of spreading the directions in which the sound can travel - rather than having everyone talking into the same central point. If users are positioned in a rectangular configuration, as oppose to a traditional cluster, then they will face less distractions and be able to communicate on the phone more succinctly. The use of dividing screens are also a very effective way of reducing noise pollution in your call centre. They create a more personal workstation for each user, and act as a barrier for travelling sounds. Upholstered screens in particular are a great way of insulating sound to minimise the effect it has on surrounding workers. 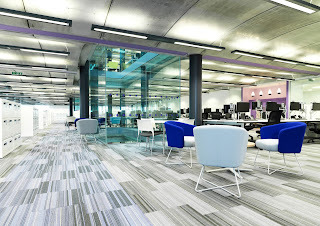 That's not to say that call centre workers will become cocooned within their own workstations of course, as the surrounding space can be made light and open to encourage social interaction. The development of breakout areas in large call centre environments encourage the social element of office work. They provide a space for employees to eat their lunch and catch up with colleagues, and have become a proven way of encouraging good job satisfaction. It might sound like a very basic addition to your call centre, but breakout areas provide employees with a space away from their desk to relax and regenerate. They really help to boost productivity, comfort and job satisfaction - all of which are integral to the success of your business! Looking for the office chairs and tables then, get the furniture from the online store. Get the stacking conference chairs in which you feel comfortable.